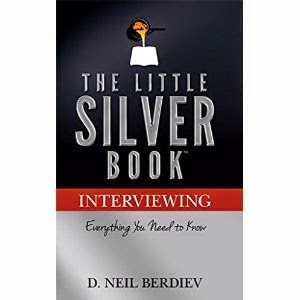 "The Little Silver Book," by D. Neil Berdiev, is a comprehensive guide on maximizing your job interview. This book really runs the gamut, covering everything from networking to business writing skills to the actual interview to the post interview. "The Little Silver Book" is written in an easy-to-read manner, breaking the info down into bullet points and small sections. There are also action points at the end of each section, which state succinctly what you need to do. There's a section on confidence that I particularly like. I think this is a book that'd be great for anyone preparing for a job interview, whether it's your first interview or you're a professional looking to move to a better company. Highly recommended!